In addition to using the new incarnation of the Doctor to shake up audiences’ expectations on DOCTOR WHO, the new Time Lord (Peter Capaldi) will have a much different relationship with companion Clara Oswald (Jenna Coleman). So, would a different companion have any better luck with the new Time Lord? Leaving aside those rumors of a male companion, what about someone who knows the Doctor really (really) well — say, Prof. River Song? What do you think? 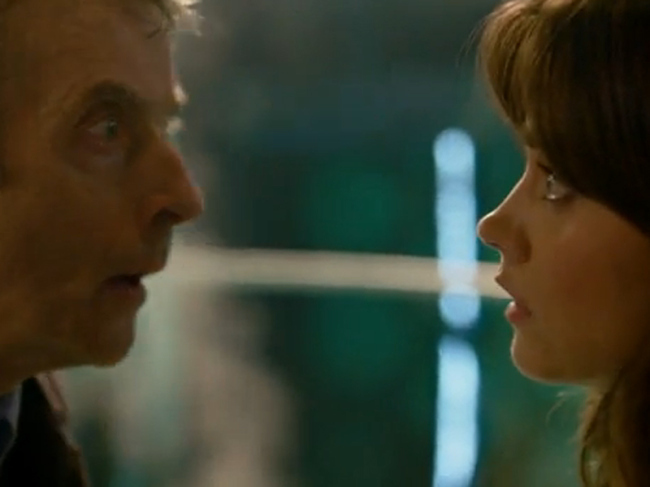 Is there a past companion who would get on well with a more madcap, dangerous Doctor? This entry was posted in Actors/Actresses, Behind the Scenes, Cult TV and tagged 12th Doctor, Alex Kingston, Clara Oswald, Doctor Who, Doctor Who Magazine, Jenna Coleman, Peter Capaldi, River Song, Steven Moffat. Bookmark the permalink. I am hoping that they don’t get rid of Clara to soon as I think that might upset viewers they don’t care about that though I don’t think. They will shake it up whether we want it shaken or not. So I will keep watching just hoping for some familiarity. I hope Clara gets the whole season to hang around before Moffat introduces a companion tailored specifically for the Capaldi Doctor. I like her and I think, having saved the lives of all the other Doctors, she deserves the chance to guide the new one into his new life. My outlook on Moffat changing things up is, he gives the fans what we didn’t know we wanted. It really is time to change things up. And it sounds like he’s going to take a crack at doing the Sixth Doctor correctly. Poor Colin Baker was so ill-served by the writers and John Nathan-Turner during his era. Yes, yes me too she at least deserves this, I feel there is so much more for us to experience with Clara and I hope that she has at least a year with Capaldi it will def help the transition to this new Doctor I am just beyond grateful he regenerated. I have to agree with you I always at first am scared of the change i.e Clara from Amy and Rory, but after minutes of the new I am always happy with it. He does no exactly what we want even if we don’t. What are your thoughts on a solely male companion? Read that might happen somewhere.